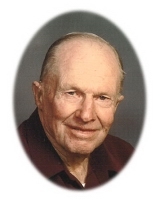 Carl Lawrence Kotilinek, age 85, of Maple Lake, MN, died Friday, March 18, 2005 at home. Mass of Christian Burial was held 10:30 a.m. Monday, March 21, 2005 at St. Timothy`s Catholic Church, Maple Lake with father Mark Huberty officiating. Burial followed in the parish cemetery. Carl Lawrence Kotilinek was born December 23, 1919 in Maple Lake to George and Lillian (Pavlik) Kotilinek. He served his Country in the US Army during WW II with the 612 Tank Destroyer Battalion. Carl fought in Normandy, Ardennes, and Battle of The Bulge, and received many unit citations. He later met up with the Russian`s in Czechoslovakia. He married Clara M. Barthel May 7, 1955 in Minneapolis and she preceded him in death May 24, 1989. After the war Carl farmed the Kotilinek homestead in Maple Lake Township until retiring in 1982. Carl lived in Maple Lake all his life where he was a member of St. Timothy`s Catholic Church, Maple Lake VFW Post #7664, and the Maple Lake American Legion Post #131. He loved his family, church, farming, the outdoors, and cutting wood. Carl is survived by a son, daughters, and their spouses, Tom (Wendy) of Maple Lake, Rita Kotilinek and fiancé, Jerry Austin of Greenbush, Amy (Mark) Loch of Maple Lake, Mary (Joe) Ackerman of Silver Creek, and Lisa (Dennis) Georges of Buffalo; and 17 grandchildren. He was preceded in death by brothers, Leo, Mark, and Ralph; and a granddaughter, Caroline Loch. Pallbearers will be Christopher Adair, Shane Fertig, Jacob Ackerman, Chase & Derek Kotilinek, and Music for the funeral provided by Sarah Goelz and Krista Elsenpeter. Arrangements were by Dingmann Funeral Care, Maple Lake.